For the finest in interior design, the 2019 Land Rover Discovery Sport deserves a close look. An optional third row allows for more seating, making it a good choice for West Windsor families. 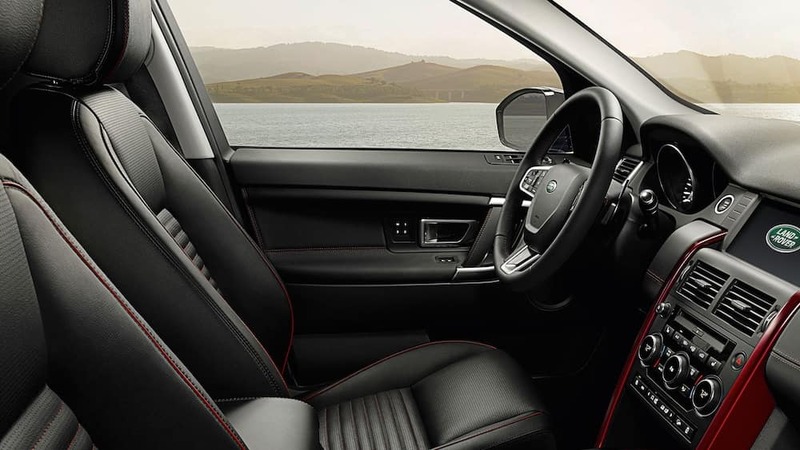 An available perforated leather steering wheel and customizable ambient lighting provide a genuine luxury SUV experience. Explore the Land Rover Discovery Sport interior dimensions and features today. Technology – A standard 8″ touchscreen provides access to select smartphone apps, and a configurable interior ambient lighting system lets you set the mood. Audio – Choose between a 10-speaker Land Rover Enhanced Sound System or an 11-speaker Meridian Sound System. Enjoy concert quality audio on the streets of South Brunswick. Seating – Options include a perforated grained leather, partial leather, and Windsor leather. All models feature 60/40 second-row seats with recline and slide function. Trim – The details of the Land Rover Discovery Sport SUV stand out. Select models include ebony headlining, illuminated aluminum front tread plates, and a dark grey brushed aluminum center console. That’s more cargo room than the 2019 Audi Q5, one of its top competitors. It offers more front legroom than the 2019 BMW X5 as well. For more information about the new Land Rover Discovery Sport,turn to Land Rover Princeton near Flemington. We’re excited to show you this award-winning premium SUV’s exterior design along including its impressive towing capacity, and our range of Land Rover and Range Rover lease deals. Find out more today!